Mary: All this talk about smoking a turkey got my mouth watering. I didn’t think you’d mind two turkeys in a row since you were all for two cakes in a row <cake one> <cake two> and it is Thanksgiving after all! 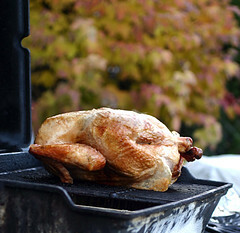 The first time I made this turkey was in the early 90’s after I had won a very basic charcoal smoker. I had my turkey prepped and woke up soooo early to get the thing going, in the cold Minnesota weather, so I could baby sit that bird for nine hours! The turkey never did get up to temp so we finished it off in the oven. By God, that was the best turkey any of us had ever had and I dream about it still, so moist, so smoky, so delicious! I tossed that smoker years ago and now just convert my gas grill to do the smoking for me. 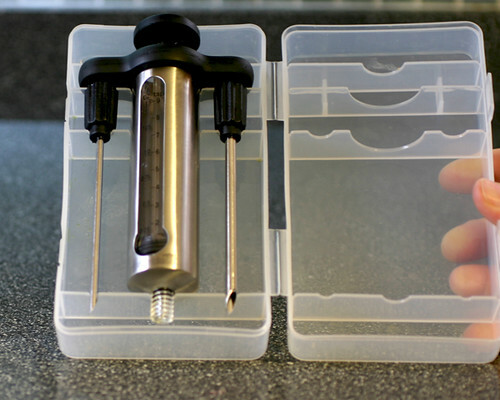 It’s much easier and keeps the temperature nice and steady. Sorry you purists out there, it’s cold up here in the Northland. 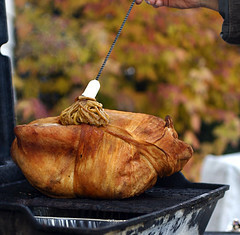 If you recall, Sean made this turkey when we first started the blog. Since we were new, it didn’t get much play. I didn’t think you’d mind an updated version with more photos and verbiage. Sean said in June 2009: We’re not big talkers (just big eaters!) and only want to say that this was one tender turkey! It comes from the cookbook: Smoke & Spice. ….It was a short drive home, and I arrived in time for dinner, which was moose tenderloin lightly fried in olive oil with salt, pepper, and garlic. Oh, man. It is so good to have that void in the freezer filled once again. In speaking with Mom and Mary on the telephone during the previous couple of weeks we’d touched on various recipes that got Rose and I fired up to get the water smoker out and cook up some “worth the wait” meat. This smoke-cooker doesn’t work well in colder autumn temperatures up here, but it’s great in August and September, and the week before we’d found that, while we don’t have the patience or schedules for the six hours or so to do a turkey, a chicken only takes two hours and is unbelievably good. You inject the meat with a mixture of garlic-flavored oil, beer, and cayenne pepper and rub it over and under the skin with a garlic, pepper, salt, and oil paste. 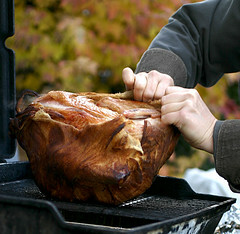 Then you just pop it into the smoker and make sure you keep wet wood chips on there until it’s done…. Mary: This is the first year I made it a point to go get a fresh turkey without any salt solution injected into the bird. 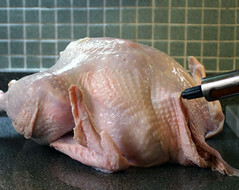 It’s always fun to watch the bird puff up when the ‘juice’ is injected into it. And this time it actually stayed in the bird instead of dripping all over the place because the bird wasn’t already stuffed’ with other fluids. 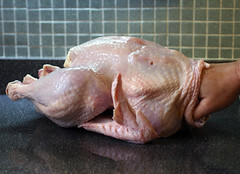 Remove the giblets and neck from bird. Pat dry, optional to wash. Loosen skin under breast and legs. Combine the marinade below, and inject this mixture into the bird, mostly in the breast – move the needle around to get optimal coverage. I snuck up under the skin so I wouldn’t poke too many holes and rip it exhibit 4-5. If you’re using a fresh chicken without any salt injections, I would add 2 tsp of salt to this mixture making sure it dissolved. Whisk to combine then inject into meat of the bird. 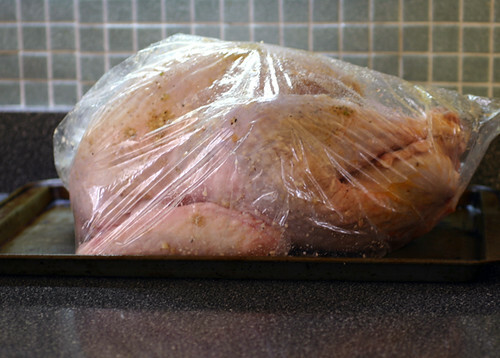 Do these first two steps then wrap it up in a large plastic bag and let the bird sit in the fridge 24 hours or at least over-night. 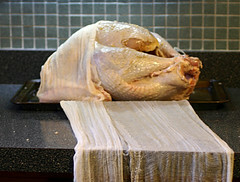 Wrap bird in plastic bag then place on a sheet pan for stability. 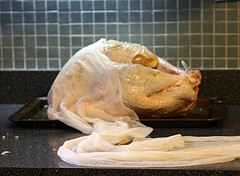 Take the bird out of the fridge a good 45 minutes to an hour before smoking then wrap the bird in a dampened cheesecloth and tie the ends together. Don’t ‘mummy’ it, you should be able to feel the skin through the cloth. 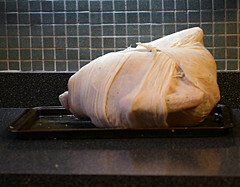 After six to eight hours cut off cloth – turn the bird right side up and baste the turkey until it’s finished cooking. You can finish the bird off in the oven too, if you’d like. Now my mouth is watering for some smoked turkey, too!! 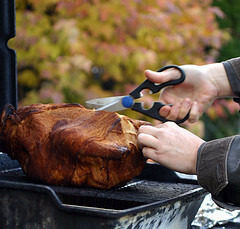 Wow – a smoked turkey? I may have to try that. 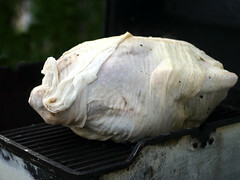 I brined our turkey last year and it was so juicy and moist, even though I almost burned it on our grill! That sounds great! I had a smoked turkey years ago and it was one of the best Thanksgiving turkeys I’ve ever had. I’ll have to keep it in mind for next year though since I’m not cooking this year! Oh, boy, I wish I could go to Thanksgiving at YOUR house! If the day comes that I venture from my “do nothing” turkey, this will be the recipe that I choose. Wishing you all a lovely Thanksgiving!